The "war to end all wars" fell far short of that noble aspiration. What history now refers to as World War I, which ravaged Europe from 1914 to 1918, did stir worldwide yearning, however, for peace. One direct result of that fervent hope was the League of Nations. 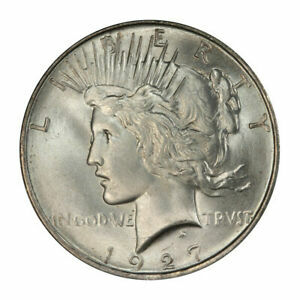 A second, less ambitious but equally sincere, was the Peace dollar. America shunned the League, but warmly embraced the coin. Following the war, there was widespread sentiment for issuance of a coin that would celebrate and commemorate the restoration of peace. The American Numismatic Association played a key role in fostering this proposal. At the same time, the U. S. Mint found itself facing the need to start producing millions of silver dollars. That need grew out of the Pittman Act, a law enacted in 1918 at the urging of and clearly benefiting silver-mining interests. Under this measure, the government was empowered to melt as many as 350 million silver dollars, convert the silver into bullion and then either sell the metal or use it to produce subsidiary silver coinage. It also was required to strike replacement dollars for any and all that were melted. Aside from helping silver producers, the law also aided Great Britain, a wartime ally at the time. During fiscal years 1918 and 1919, the U. S. government melted a total of more than 270 million silver dollars, and the great majority of these 259,121,554 ended up being sold in bullion form to the British, who needed the silver to deal with a monetary crisis in India. During that same period, the United States melted 11,111,168 silver dollars to obtain new raw material for subsidiary coins of its own. The coins that were melted under the terms of the Pittman Act represented nearly half the entire production of standard silver dollars (as distinguished from Trade dollars) made by the U. S. Mint up to that date. Even so, the loss was no particular blow to the nation's commerce. Silver dollars were seeing only limited use, and remaining inventories were more than sufficient to serve commercial needs. Demand for the coins was so minimal, in fact, that none had been produced for more than a dozen years since 1904. Against this backdrop, the Mint had no reason to strike new silver dollars as replacements for the ones that had been melted but the Pittman Act required it to do so. Accordingly, in 1921, after the price of silver had fallen from postwar highs, it started cranking out the long-suspended Morgan silver dollars once again. It did so, in fact, in record numbers: During that single year, the various mints produced a total of more than 86 million examples easily the highest one-year figure in the series. By interesting coincidence, Morgan dollar production resumed on the very same day May 9, 1921 that legislation was introduced in Congress calling for the issuance of a new silver dollar marking the postwar peace. As described by its sponsors in a joint resolution, the new coin would bear "an appropriate design commemorative of the termination of the war between the Imperial German Government and the Government of the people of the United States." Congress adjourned without taking action on the measure. It turned out, however, that congressional authorization wasn't really needed, since the Morgan dollar having been produced for more than the legal minimum of 25 years was subject to replacement without specific legislative approval. To obtain designs for the coin, the federal Commission of Fine Arts arranged a competition involving a small group of the nation's finest medalists. The nine invitees included such famous artists as Victor D. Brenner, Adolph A. Weinman and Hermon A. MacNeil, all of whom had designed previous U. S. coins. But the winner turned out to be a young Italian immigrant named Anthony de Francisci, whose finely chiseled portrait of Liberty was modeled after his young wife Teresa. The reverse of the coin shows an eagle in repose atop a crag, peering toward the sun through a series of rays, with the word PEACE superimposed on the rock. No other U. S. coin produced for circulation has ever borne that motto. Production of 1921 Peace dollars didn't get under way until the final week of December, and just over a million examples were produced. It soon became apparent that the coin's relief was too high, making it hard to strike and causing excessive die breakage. The Mint corrected the problem in 1922 by reducing the relief but in the process, it somewhat lowered the coin's aesthetic appeal, as well. By 1928, the Mint had produced enough Peace dollars to satisfy the Pittman Act's requirements. It thereupon halted production. 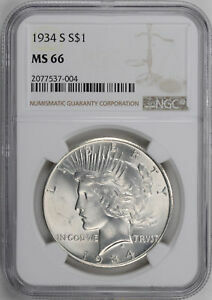 The lid on silver dollars was clamped down even tighter with the onset of the Depression the following year. The design returned for a two-year curtain call in 1934, largely because more cartwheels were needed as backing for silver certificates. The 1934-S proved to be one of the key coins in the series, along with the 1921 and the 1928. The mintmark is below the word ONE on the reverse. A handful of matte proofs exist, but only for 1921 and 1922. Silver dollars of both designs were largely ignored by collectors until the early 1960s, when silver certificate redemptions and the publicity surrounding the Treasury's sales of $1,000 bags of dollars to all comers created new interest in the large silver coins. Ironically, Peace dollars had been readily available at banks for decades, and following Treasury Department policy, were paid out before Morgan dollars were disbursed. 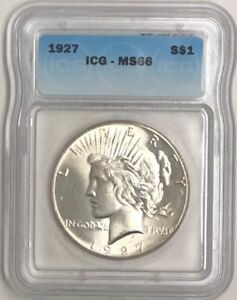 But few collectors were interested in completing sets of these relatively expensive coins, finding it more practical to assemble collections of the smaller denominations: A silver dollar represented a considerable sum in the 1930s and `40s enough to buy five dozen eggs or ten boxes of Wheaties. 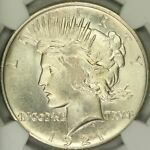 It wasn't until the very early 1960s, when the Treasury had almost emptied its vaults of Peace dollars, that the more sought after Morgans started to pour forth, fueling collector enthusiasm for both series in the process. The entire run of Peace dollars consists of just 24 coins, none of them great rarities. Thus, many collectors strive for complete date-and-mint sets. Pristine, high-grade pieces are elusive, however; weak strikes were common, and the broad, open design made the coins vulnerable to wear and damage. Points to check for wear are Liberty's face, neck and the hair over her ear and above her forehead. On the reverse, wear will first show on the eagle's wing, leg and head. The Peace dollar's early demise was ominously symbolic. Four years later, in 1939, World War II erupted in Europe. The design came very close to reappearing once more in 1964, when Congress authorized production of 45 million new silver dollars, apparently in an effort to serve the needs of Nevada gambling casinos. With the smaller silver coins rapidly disappearing from circulation, this was viewed as a gift to special interests. After the Denver Mint produced 316,076 Peace dollars (dated 1964) in May of 1965, the authorization was rescinded by order of President Johnson. Although all pieces were to be recalled and melted, rumors persist of several coins surviving. Bowers, Q. David, Silver Dollars & Trade Dollars of the United States, A Complete Encyclopedia, Bowers and Merena, Wolfeboro, NH, 1993. Miller, Wayne, The Morgan and Peace Dollar Textbook, Adam Smith Publishing Co., Metairie, LA, 1982.